The following statements in relation to Kashmir are bound to vex one side or another. But I believe they are undeniable. One, India does not rule in Kashmir with the consent of the governed or by Kashmir’s demonstrated choice. Two, the killing and blinding of Kashmiri demonstrators has hurt India’s image worldwide. Three, the Indian people are not likely, in the foreseeable future, to allow the secession of Kashmir. Even if a government in New Delhi were to be open to the idea, the Indian public can be expected to tie the government’s hands. Four, Kashmir Valley is the heart of the matter. The majority of the people of Jammu and of Ladakh are not alienated from India. Five, nowhere in the real world is self-determination absolute. Even large countries cannot do all that they wish. A Kashmir independent in name may be imagined but not a Kashmir factually independent. In practice, Kashmir cannot successfully defy India and Pakistan. Six, while Pakistan claims Kashmir because of its Muslim majority, its Muslim majority has also been a reason for India’s attachment to Kashmir. When, in the late 1940s, Kashmiris led by Sheikh Abdullah opposed the attack from Pakistan and seemed eager to join India, they were welcomed as opponents of the two-nation theory. This statement carries an exception. Sections in India would want to hold on to Kashmir’s land but have no feeling for its people, not, at any rate, for its Muslim majority. Seven, radical Islam did not cause Kashmiri alienation but is eager to exploit it. This is something that all Kashmiris, especially those concerned with human rights, should recognise and prepare themselves for. Eight, any sincerely meant agreement on Kashmir that India and Pakistan can reach will probably be accepted by Kashmir. Given Pakistan’s political realities, however, such an agreement is not at present visible on the horizon. Nine, the most that can currently be hoped for is an agreement between New Delhi and a Kashmiri political coalition to bring genuine and substantial self-government to Kashmir. Forces in Pakistan and elements in Kashmir and in India will do their utmost to prevent such an agreement and, thereafter, to undermine it, but such forces and elements can be overcome. Which is less likely, a will in New Delhi to reach such an agreement, or a will for it in Kashmir? This is a toss-up. If India is serious about its prestige in the world, about being a major global player, and about getting a permanent Security Council seat, then it will have to summon the will to find an agreement with genuine representatives of the people of Kashmir. If Kashmiris are serious about wanting a decent future for their children, they will have to think of fresh methods, free of radical Islam and free of violence, for protesting excesses and demanding azadi. And they will need to forge a united leadership. Once non-violent weapons make the headlines from Kashmir, and a united team speaks on behalf of the Kashmiri people, public opinion in India can compel New Delhi to offer handsome terms to Kashmir. Instead of running away from realities, we must face them, whether we see ourselves as Indians or only as Kashmiris. Over Tibet, for instance, we know that it is not just the Beijing government or the Chinese Communist Party that denies autonomy to the people of Tibet. The people of China seem opposed to it. Similarly, it is not just the Indian security forces or leaders in New Delhi who are against Kashmiri independence. The people of India seem to have set their face against it. 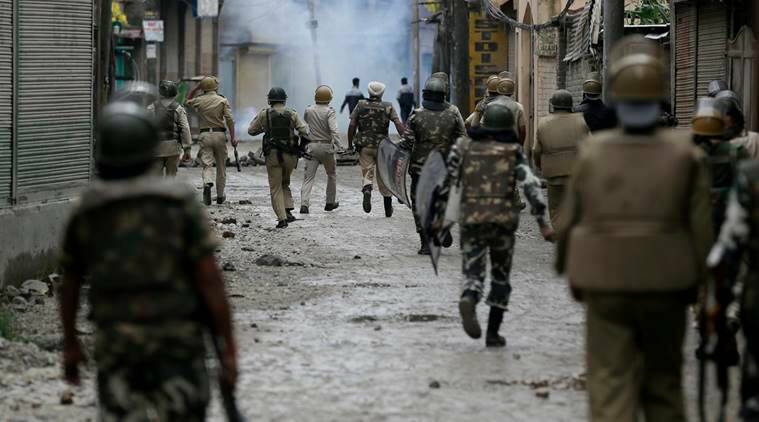 Moreover, while opposition to Indian rule in Kashmir is palpable and persistent, Kashmiris do not appear to be in any position to remove that rule. The history of violent rebellion against overwhelming might is not encouraging. It usually fails, it invites greater repression, and rebels and their families end up as the worst sufferers. This is what happened in India in 1857. It is what happened throughout Africa in the 20th century. In all cases, the power of the dominant state was strengthened and consolidated by unwise rebellion. Contemporary Palestine offers confirmation of this history. So does Kashmir over the last several decades. What is the way out for spirited Kashmiris (or Tibetans and Palestinians)? Do not infuriate the Indian people (or the Chinese people, or the Israelis). Shame and embarrass them, instead. Influence world opinion, as well as Indian (or Chinese or Israeli) opinion, by adopting unexpected and non-violent methods of showing rejection of uninvited rule. And thereby save precious Kashmiri, Tibetan and Palestinian lives, and restore a semblance of normal life for old, sick, and very young Kashmiris (and Tibetans and Palestinians). To eschew violence is no betrayal of your dream. No rejection is stronger than the one harboured behind a calm face. No arms are stronger than those — empty of gun, grenade or stone — that swing freely, with faith in the ultimate triumph of a pure goal. Is there a will for such a resistance in Kashmir? And Indians with a conscience must ask themselves if they will be proud, come 2047, of virtually a century of coercive rule over Kashmir.